BBC’s ‘The One Show’ borrowed two of NatureSpy’s camera traps to film a piece on beavers in Scotland which was aired earlier this week. Watch some of the footage here. 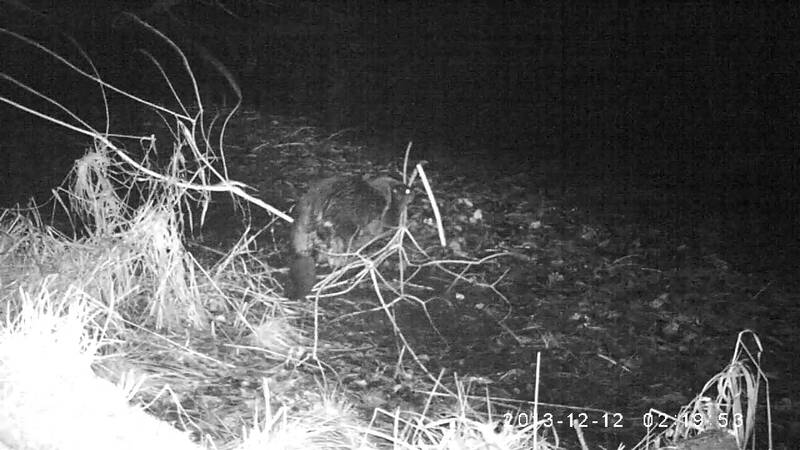 We were keen to learn more so asked Paul Scott, a Perthshire-based naturalist, to write this great guest blog to give us the latest on his camera trap studies of the controversial beavers and the uncertain future they face. There are all sorts of clever security devices to protect your camera trap from unauthorised removal by bears or poachers. The added worry when beavers are the chosen subject is that not only will the camera have gone but the whole tree will be missing as well. Cleverly designed boxes and ultra-strong locking devices are no match for Castor fiber. The monitoring phase of the Scottish Beaver Trial has now ended. Beavers were released under license in 2008 to the remote Knapdale forest in Argyll. Things didn’t go exactly as anticipated as it soon became obvious that the River Tay catchment area in Perthshire already had a thriving wild population, dating back to the first sighting by a group of canoeists on the River Earn in 2001. The Scottish Wild Beaver Group was granted a tolerance and study period by the Scottish government for the Tay beavers. The Scottish Natural Heritage who will present the findings to the Scottish Government Environment Minister this coming May. Expectations that the final decision will herald a positive future for the species are high among conservationists. Now in 2015, The Scottish beaver population is estimated at around 200 animals. The story doesn’t stop at Gretna though. Support is gathering for a Welsh beaver trial and English beaver believers now have their own banner firmly planted on the banks of the River Otter in Devon. Here camera traps are also being used to great effect in the media battle for hearts and minds, thanks to Tom Buckley. Tom Buckley, I salute you! All this means that beavers are now likely to become a more common target species to camera trappers. Camera traps offer an intimate view on the lives of beavers, sometimes extremely intimate. You can often hear snippets of vocalisations while beaver watching on the long summer nights, but I had never heard anything like this before. Minnie Mouse on Helium springs to mind. Telling two beavers apart by sight is almost impossible. 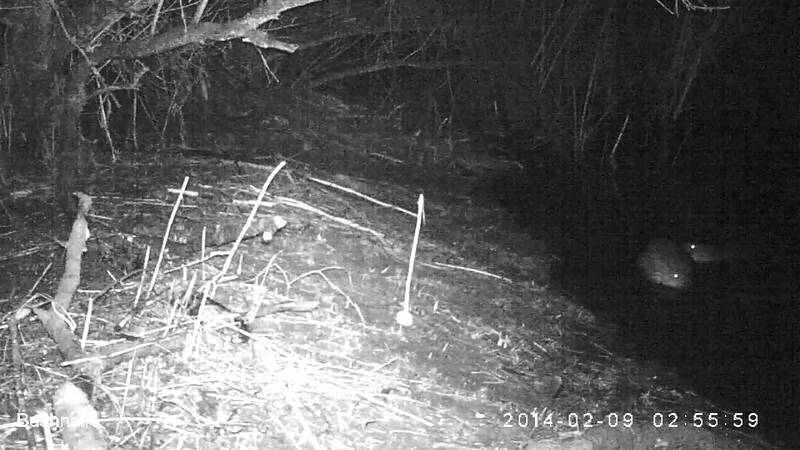 Size differences are more often slight than obvious but the tails can often show unique patterns of scarring that help tell one beaver from another, especially when lit up by IR glow. Mostly you find a straight tooth scar from another beaver but otters can also take a good chunk out during confrontations. This clip shows a straight tooth scar on the middle left portion of the tail. Concern was often raised on the lack of a natural predator for beavers in the UK until a badger at Knapdale put minds to rest. Brock the beaver assassin maybe isn’t alone though. Otters and beavers usually rub along peacefully, but all that changes in the Spring and early Summer when bite sized beaver kits are around. Otters have been observed entering lodges many times now but so far no video of an actual kill has been obtained. One looked very promising but frame by frame analysis proved that it was actually two otters wrestling with each other. Foxes are the other most likely kit predators as they too are regular lodge stalkers. Catching them in the act on a trail camera would go a long way towards easing the minds of some landowners. So the problem remains. 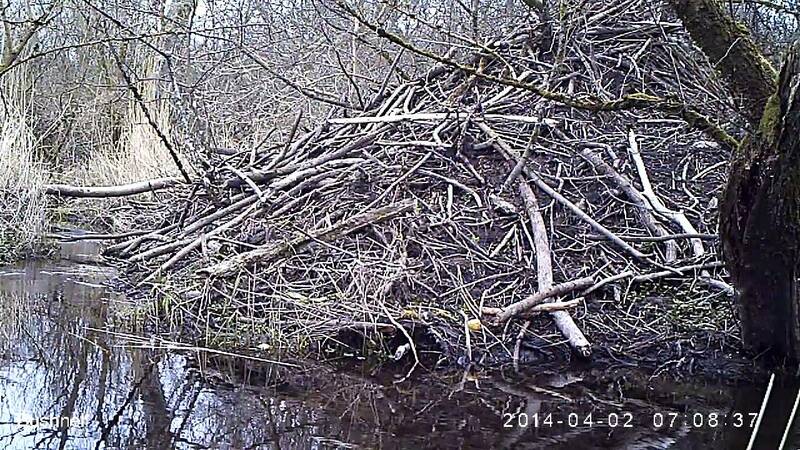 How do you prevent a beaver from swimming off with the tree you’ve left your trailcam attached to? Beavers always have a good sniff at the trunk before selecting which Willow or Aspen to have for lunch. A liberal application of chilli powder to a height of 1m should do the trick. They really don’t like a nippy nostril! You just need to keep your fingers crossed that it doesn’t rain. Loch of the Lowes nature reserve near Dunkeld have their own resident beaver family who regularly provide amazing close encounter beaver experiences from the loch side hides. It’s the perfect place for anyone seeking an audience with these amazing wetland engineers. The Scottish Wild Beaver Group are holding their inaugural conference “The Necessary Beaver” on March 28th 2015. A host of eye catching speakers from home and abroad will take part in what will surely be a must see event for all interested in the species and wider rewilding issue. For further information and ticketing details, please click here.